Vacation in one of the premier beachfront homes located in beautiful Gulf Shores. One of the most beautiful and desired locations on the Gulf of Mexico! 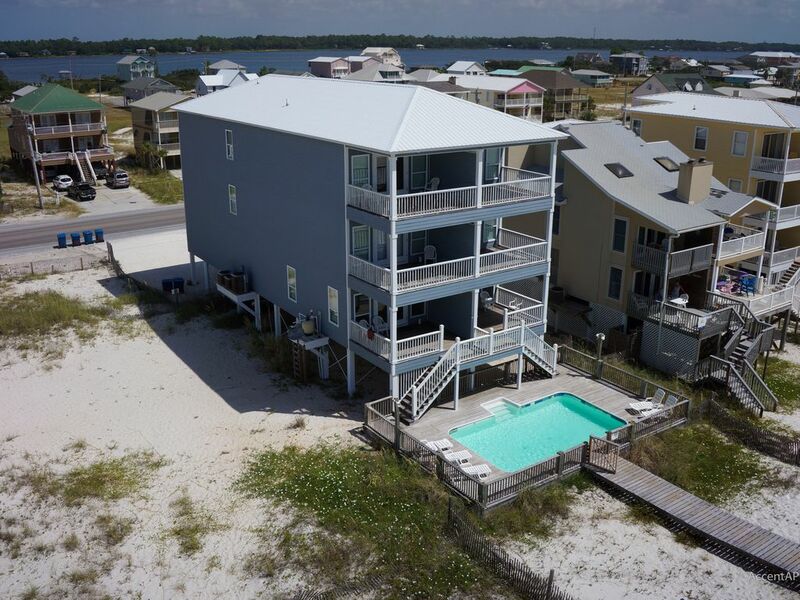 Endurance Beach House is located directly on the beach, in the heart of Gulf Shores with multiple decks offers spectacular views and sunsets. Our beach house has all of the conveniences of home. It is conveniently located approximately 2.3 miles west of Hwy. 59 on West Beach Blvd (Hwy 182). The house is located on the absolute best beach area on West Beach. On the first floor, there are two private Master Suites(King Beds). On the second floor, there are two gulf front, private Master Suites(King Beds), two rooms with a set of full-size bunk beds, and two rooms with two full-size beds. On the third floor, there are two gulf front, private Master Suites(King Beds), two rooms with a set of twin-size bunk beds, and another twin-size bed; and the other two bedrooms have king-size beds in them. Two large living areas, two dining areas and two fully-equipped, modern kitchens. Large Gulf Front 14 X 24 Ft.
Amazing Sunsets, House and Hosts ! This house is incredible ! We were greeted by the sound of ocean waves, a beautiful sunset and an amazing host. Nothing beats falling asleep on one of the six balconies while listening to the sounds of the ocean and watching the sun sink into the Gulf waters. The fact that we had our own private pool and the beach right there steps away beats staying in crowded condos any day. If you are truly looking for a place to relax with a large family or group where everyone can have their own private rooms, bathrooms and large gathering areas while feeling like you are in the Islands at a Ritz Carlton property then look no farther than this beach house. From the ironed sheets to the well appointed room furnishings we were very impressed by the attention to detail. We just hope this property is available each year when we make our beach trip ! Ocean views are AMAZING! We had our daughter’s wedding on the beach behind the house. It was a perfect setting and the house was set up perfectly to house the groom’s family on one side and the bride’s family on the other. We wish we could have stayed longer! We rented Endurance Beach House for our wedding week. We LOVED it!! All of our guests had a great time also. My sister and her family stayed the whole week with us & others came later in the week. I would definitely recommend this house to large groups. Just FYI, all the way to the water is owned by the owner of the house. So you can have your wedding right there close to the ocean! I wish we would had known that but our wedding was still beautiful! Thanks Dean!!! We recently rented Endurance for our daughter's wedding week. The wedding was on the beach behind the house. As we have a large family and planned on housing the wedding party, Endurance was a great size (gigantic) for accommodating everyone. There are many bedrooms and bathrooms. The pool was amazing, and we used it quite a bit. The wedding was beautiful and as close to perfect as it could be. Everything was wonderful, and we appreciated how accommodating Dean Young was with us. I would definitely recommend Endurance for a wonderful time at the beach. Our family of 30+ including our Mom, siblings, children, grandchildren and great grandchildren spent a wonderful week at Endurance Beach House. The house was clean and extremely comfortable. The rooms were large enough to easily move around in. The set-up, having one large dining space and another living area, suited feeding our large group very well. The boardwalk to the beach was excellent and having a private pool was a huge benefit. We've rented many beachfront homes over the years but Endurance was by far the best. Thank you so much for sharing Endurance with us. Second year in a row for a great company vacation. We will be back!